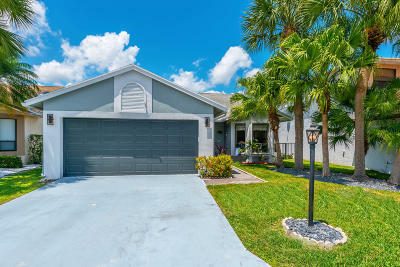 Beautiful single story lakefront home with 3 bedrooms, and 2 full bathrooms. The 2 car garage has been converted to a bonus room/play room/man cave. The home features a beautiful updated eat-in kitchen with stainless steel appliances, high ceilings in the living area, large and screened patio. House is freshly painted, ac units from 2017, and new irrigation system. Low HOA with only $120 month including: Comcast cable, community pool, great Boca Raton Schools, close to all retail stores. This is a pet friendly community. Listing Courtesy of One Sotheby's International Realty, Inc.